A while again I had written about the Jamela 24K Gold Under Eye Masks and the Jamela Lavender Nutritional Face Mask. I loved both those products immensely and today I am here with yet another Jamela mask - the Chamomile Gentle Restoration Face Mask. This one piece gel facial mask is absolutely fantastic. If you have used sheet masks, you will know how convenient they are - easy to apply and even easier to remove. The same holds true for this Chamomile Face Mask from Jamela Skincare. Simple mess-free application. The mask comes in a shape and size that would fit most. Since it is not fabric but rather a gel material, you have more control on the placement of the mask. Like I mentioned in my earlier review, you can work with the mask on. Once you have it on your face, it stays put and doesn't fall off. The suggested time to leave the mask on the face is 30 minutes, but I always leave it on longer - at least 1.5 to 2 hours. By that time the skin would have absorbed all the goodness present in the mask. I have sensitive skin prone to redness which is exacerbated by light. The Chamomile mask was a perfect antidote for the inflammation and redness. My skin looked plump, hydrated and clear after using the mask. No sign of any redness or irritation. It felt like I had a new skin. Every time I use these masks form Jamela Skincare, I am amazed and extremely pleased with the results. The Chamomile Facial Mask uses German Chamomile, which contains phenols with antiseptic and healing qualities. Chamomile oil also contains lipophilic and flavonoid compounds which reduces the redness of the skin caused by enlargement of the blood capillaries. If you have sensitive skin prone to redness or rashes, then this mask is for you. I cannot recommend it enough. You have to try it to experience its effectiveness. 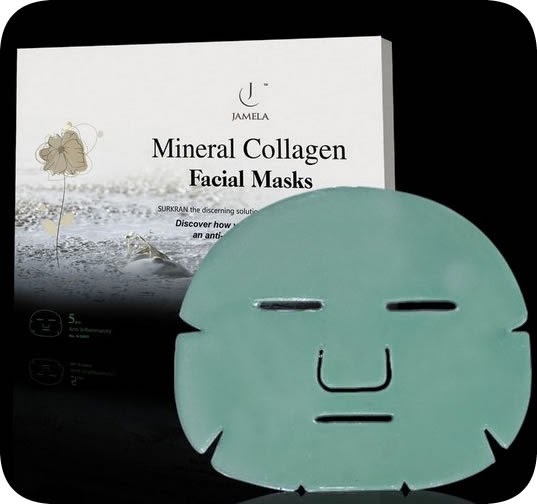 A pack of 5 masks costs £49.50 and can be purchased online at Jamela Skincare. Tip: If you keep the pack in the refrigerator for about 30 minutes prior to using the mask, the cooling effect is excellent. Perfect for warmer days. I currently have a giveaway running to win 8 pairs of Jamela Skincare's 24K Gold Under Eye Masks. Have you entered?